The adult Yellow-legged Gull was again in the roost at Wykeham South Lake, also there were 3 Goldeneye, 3 Goosander, 30 Linnet and a Brambling. 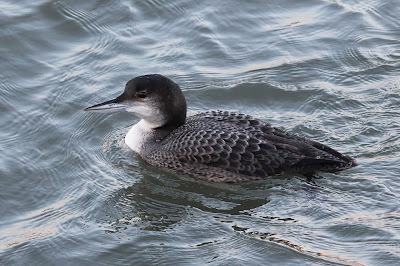 The Great Northern Diver was still in the Harbour, 2 Red-throated Diver, 2 Great Crested Grebe and 14 Common Scoter were in South Bay, 5 Red-throated Diver, 14 Linnet and 20 Yellowhammer were at Cloughton Wyke, 68 Teal, 17 Wigeon and 9 Curlew were on Johnson's Marsh, 2 Peregrine were seen over Ruston Carr and 30 Brambling were at Cockmoor Hall. On the move (north unless stated) were 2 Red-throated Diver, 11 Fulmar + 2 south, 5 Gannet, 12 Herring Gull south, 4 Great Black-backed Gull south, 11 Kittiwake and 16 Guillemot.